Some people visit Ireland and have the perfect itinerary planned out, down to the last minute of their trip! But if you’re like me, you probably don’t even have your transport organised from the airport to your first stop! Not to worry, the team here at Galway City Hostel, have listed the top 10 things to see & do while in Ireland. It’s not everything to see in Ireland, it’s just our favorite places to see! Trying to decide on what to see and do while you have a few days in Irelands can be daunting enough but hopefully we’ll be able help make your mind up for you!! 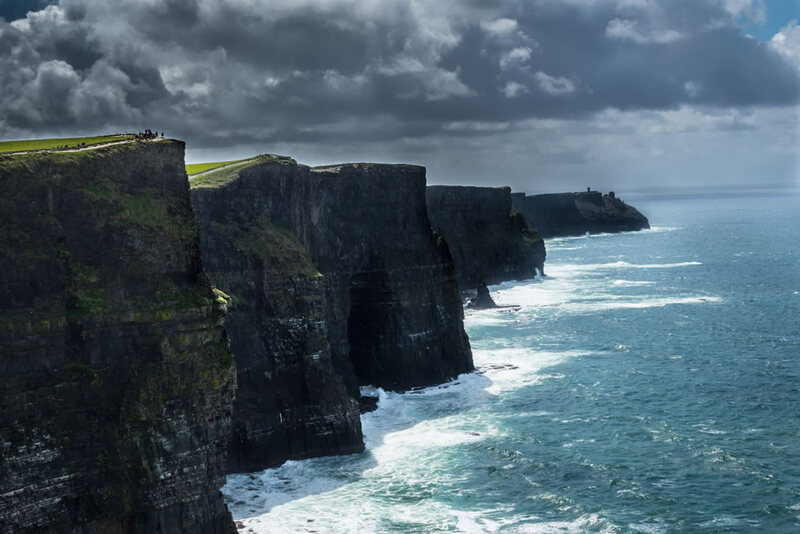 The Cliffs are the most visited attractions through-out Ireland! They really are such a pretty sight. Standing 214m (702 feet) at their highest point they stretch for 8 kilometres (5 miles) along the Atlantic coast of County Clare in the west of Ireland. Some of you Harry Potter fans might already know the Cliffs, they featured in the movie, Harry Potter and the Half Blood Prince in 2009. Kylemore Abbey is located in the heart of the picturesque region of Connemara. Oscar Wilde once described the region as “a savage beauty”, and is a region like no other with it’s unspoilt and natural beauty. The abbey is nestled beneath the greenery of the mountains and contains a 6 acred walled garden of flowers and trees. A must see when in the west of Ireland. When in County Cork, down south of Ireland, one of the nicest and most popular things to do is take a trip to the famous English food Market, which has been around since 1788. The food on offer at the market makes the drive down to cork worthwhile, you’ll find every kind of food on offer and pick up great recipes throughout the market! The Ring of Kerry is a 179-km-long circular touristy attraction in County Kerry, in the south west of Ireland. The stunning stretch of road takes you through the beautiful countryside that Ireland has to offer, showing you beautiful sandy beaches to the lushish greenery of the mountains & hills. To drive the whole route would take some time but to us, the most spectacular part of the Ring of Kerry, is the 35km stretch from Killarney Town through Killarney National Park and ending up in Kenmare. You can see everything the full route has to offer in this small stretch of breathtaking scenery! Once visited, your time spent at the Aran Islands will become your favourite and most memorable part of your trip of Ireland (apart from your stay at Kinlay Hostel Galway of course!!) Inis Mor, the biggest of the 3 islands is by far the best as you have more to see and do for your day! You get to cycle in the wild by the sea to drinking a pint (of the black stuff) (…Guiness) with a local while they are trying to teach you a word or two of Irish to dangling your legs over cliffs that are over 100m high. It really is an experience which you cannot miss while touring Ireland! The Guinness Storehouse is Dublin’s most visited attraction. Let’s face it, Ireland is known worldwide for one thing… and that’s Guinness! (The black stuff…) Take a tour around the storehouse and you will learn everything about how the wonderful glass of Irish-ness is made and even how to drink it properly!! You can even take a class on how to pour “The Perfect” pint of Guinness! Guinness Storehouse is a wonderful place to spend a few hours during a rainy afternoon in Dublin! (I know everything in Ireland seems to reside around drink… Buuuut, as they do say, When in Rome…..) Take an organised tour around the Old Jameson Distillery in both Dublin and Cork. See how the famous Irish Whiskey is made from start to finish and even sample the smooth crisp taste of the Whiskey. Tours start form 10am and go right through until just after 5! Certainly worth checking out while in either Cork or Dublin! If you’re coming to Ireland with your children, they will probably get fed up and bored of going to big castles and “boring”(to them) touristy sites. Fota wildlife Park is one to keep them happy! It is the most popular tourist attraction in Co. Cork, and it basically is a Zoo. It is a 70 acre stretch of land, beautifully converted to resemble the natural habitat of the animals they house. Very reasonably priced for the full family.